We’ve been together now for over 16 years. And in that time, I’ve been amazed by her in countless ways. To watching her deliver our two children naturally – without pain killers and drugs! And then last week, she amazed me again. And to be honest, scared the hell out of me. My phone rang, and it was from a local number I didn’t recognize. I normally wouldn’t answer it and just let it go to voicemail, but this time something told me I should take the call. Instead, I put my phone on speaker and said hello. The voice on the other end said “Is this Dan?” and I said yes. I’ve got a pretty good stomach, but this news pushed it right up into my throat. I stopped at the end of the driveway and took a moment to let the news sink in. Yes, she had been in a serious accident. 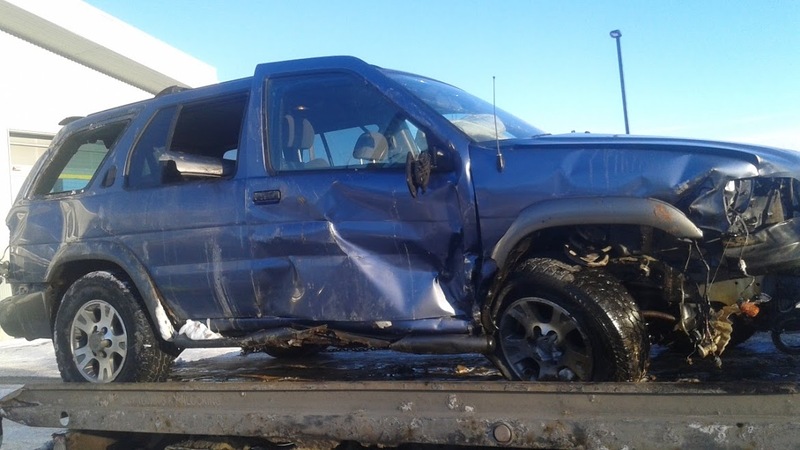 Her vehicle hit a patch of black ice and slid into oncoming traffic. Her vehicle had flipped (onto it’s side I later found out), and people had rushed over to pull her out of the vehicle because it was on it’s side and she couldn’t lift the door open far enough, or pull herself out. She was in a lot of pain and wasn’t able to walk (because of the broken pelvis which we didn’t yet know about), but she was fine. Even though she told me herself that she was ok, I still couldn’t stand not being able to rush to her. They were transporting her to a hospital in Calgary on the other side of town because the closest one was full. That particular day was a terribly cold wintery day, and the roads were treacherous. I heard later that there were over 300 accidents that day alone. She didn’t want me on the roads to come see her, and at that point still didn’t know for sure where she would end up. I came home and made some calls to notify our insurance company, and find out what I could about her vehicle and belongings. She mentioned she didn’t have her phone and wanted me to see if I could find it in the vehicle. That afternoon dragged on for ever as I waited for an update so the kids and I could finally go in and see her. Eventually I tracked down her vehicle to where it had been towed and decided to just go and pick up her things and then head for the hospital if we still hadn’t heard anything. Seeing her vehicle was a shock, but since she had told me it rolled I was prepared for it. It was so cold and dark out that we just grabbed as much as we could find and loaded back up into the truck to get to the hospital. Around that time Marilena called to say she was in the trauma unit, and that X-rays revealed that she had a broken pelvis. Despite the slippery road conditions, I did my best to get there as soon as possible. I’m happy to report, that despite 3 fractures in her pelvis, she’s already home and is making progress towards a full recovery every day. And for that I’m truly grateful! And it’s in times like this that I’m also grateful I have the freedom and flexibility to be there for my family when they need me most. 2 years ago, it was to stay overnight in the hospital with my Dad when he was battling pneumonia twice in one year. This past week, it was daily visits to the hospital to bring my wife healing foods and supplements (how does someone possibly get better on the food hospitals feed them? That’s a topic for another day), having time to look after dealing with our mangled vehicle, being home to get my kids to school and pick them up when they’re done. None of this would be possible if I hadn’t decided years ago to build a business around the lifestyle I wanted to create, instead of trying to make a desired lifestyle fit around my work. Weeks like we’ve just had reinforce for my what’s truly important in life. It’s family. It’s the people you love and who love you. It’s being free to do the things you want or need to do, whenever possible. I don’t want to pass through life just going through the motions of earning a paycheck to pay bills. I want to spend my time surrounded by people who inspire me. I want to spend my time experiencing life in all of it’s glory through travel, adventure and exploration. Doesn’t that seem like what life’s supposed to be like? Are you designing your lifestyle around your work, or the other way around? If FREEDOM is one of your highest values, and you’re looking for a way to create more of it in your life, then click this link, pay attention to the short video, then let me know you want to be part of our FREEDOM FAMILY! Thank you for sharing your story with us, it’s really insperational, it has showed me that everyone goes through different challenges. Thank you . Thanks for your comment Brian. Yes, we all face challenges in life, and I believe it’s how we respond to those challenges that determines the quality of our life.